If you are planning for a hunting trip with your buddies then hold on a minute. Are you sure you have all the right tools that you need for the trip? Once you have gotten hold of your prey, it is the time to slice the skin the animal in order to prep it for the victory meal and to do you will need one of the best skinning knives. 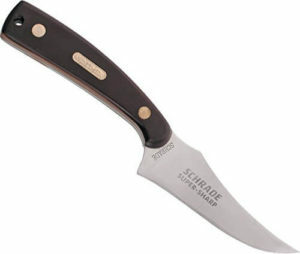 It is important to choose the most premium skinning knife and include it in your hunting gear. This is because with a great knife the job becomes way too easier and faster. We have designed this article to help you know every detail that you need to about choosing the best possible skinning knife. Whether you are a passionate hunter, or a professional chef or someone looking to build a survival gear as well, these knives are going to be your best pal throughout the journey. Are you someone who loves hunting and is looking out for building your hunting gear? Then you have found the right place to know the basics about the tools that you require. In every basic hunting gear, one thing is very common and that is the skinning knife. Well, obviously you will need something to skin the animal with before you can prep the meat for the meal. Here is where the skinning knife comes in handy. This knife is specialized for removing the skin off of the animal once it is down. 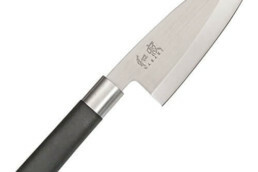 You must have a sharp edges knife to do the job with absolute precision. Having a razor-sharp and premium quality skinning knife will give you leverage and better control over the skinning process. You need to be very precise here as you don’t want to cut along and shred the meat in the process of shedding the skin. The idea here is to use the knife to the minimum. WIth a sharp skinning knife, you can skin an entire game animal with a few light strokes almost about 11 to 12 give and take. Once the animal is hanged, by the legs it is time for the skinning knife to do the job by opening the hide up. Once the hide is open it is then time to release the extremities and then pull the hide away leaving behind the carcass. The moral of the story is that with a great skinning knife you can effortlessly skin the animal in a very short time. Now that we have acknowledged about skinning knives and what they are let’s dig a bit deeper into the topic and see what makes up the best skinning knife. This will help you to learn which skinning knife you should be investing in. There are several hundreds of brands out in the market manufacturing skinning knives hence it is normal to get a bit confused about which one to pick and why. What really makes an ideal skinning knife? Well here is the answer to that my friend. Whenever you are looking out for the best skinning knife make sure you go for the one with the one with a razor sharp blade. This is the most crucial part of the knife. A skinning knife with blunt-edged blades is of no good whatsoever. The skinning knife has to be short, sharp and has a good about of depth to the blade. This depth will help provide you with a good cutting surface amount. However, if you have a larger game then opt-in for a bit longer knife. When you step into the knife section in the supermarket you will surely be overwhelmed with the range and variety of knives hanging there from the hooks. But which one to choose? That is one question that will sure mingle through your mind. Skinning knives come in various shapes and types and each has a character of its own and each one is very different from the other. Let’s have a look at some of the different types of skinning knives that you can expect to see while you are in the hunt for the best one. Knife with a fixed blade: This is the most common type of skinning knife in the market that you can easily find. It is also the most preferred and used one by many. The blade in this one is fixed and mostly unchangeable. This one’s shape differs from the other types significantly. Folding knife: If you are someone who likes to keep a compact knife that can be carried easily and hazard free then this one is the ideal option for you. Folding knives can be folded and shortened into a compact size. 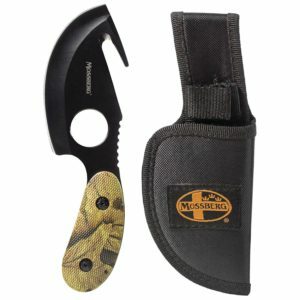 The blade gets almost concealed in the handle and is safe to carry for a hunting trip. The best part is that comes with replaceable blades. Gut hooks: This is just like any other traditional skinning knife but with a simple twist. This is rather a special feature to the skinning knife on its own and turns the knife into a great tool for cutting through the animal’s abdomen rapidly. With this feature, you can easily slit open the abdomen of the animal without having to slice up the organs. Whenever it comes to knives the name Dalstrong is hard to miss out. 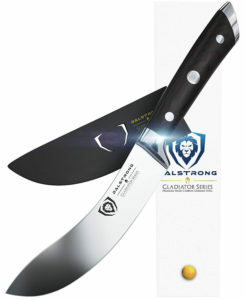 The Dalstrong gladiator series skinning knife is a great option to choose for your hunting gear. No wonder that it has been named gladiator, as this one has the most outstanding razor sharp blade and performance that you can ask for. It’s is crafted with the most spectacular design that makes it ideal for everyone to use and is highly preferred by professional chefs as well. The blade is what the most spectacular part of this knife is. It is extremely sharp and cuts through the skin without ripping off excess meat. 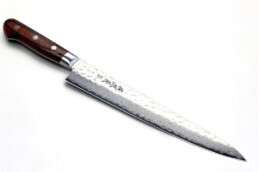 You can skin and debone and butcher using this knife effortlessly. The blades are made up of German steel with high carbon feature that makes the knife extremely durable, rust-free and corrosion free. The tempered blades are a beauty to look at with the shiny finish to it. To add to all, this is an award-winning design by Dalstrong. 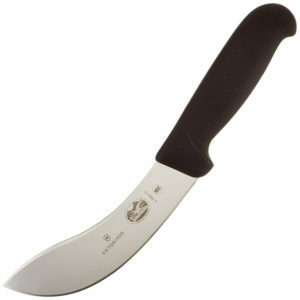 Its premium quality is hard to beat which makes this knife one of the top skinning knives in the market. The handles are made of pakkawood and are riveted three times for better balance and grip. It is hard to pass on skinning knife for your knife set and whether you are a passionate cook or a hunter, it is a must-have to invest in. 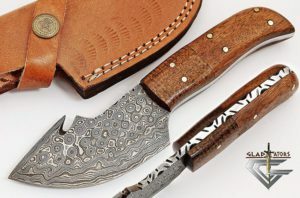 The GladiatorsGuild custom handmade Damascus steel skinner knife is the best pal for your hunting trips. Whether you are someone who loves to go on hunting trips or just a passionate professional chef, this knife will come in great use in skinning the animal and preparing it for the meal. 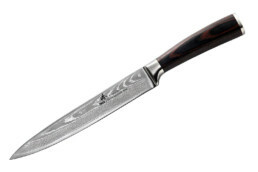 The knife is styled with a spectacular Damascus steel skinning blade which is about 7 to 7 ½ inches long. The knife is petite in size and is absolutely ideal for skinning any moderately sized animal. 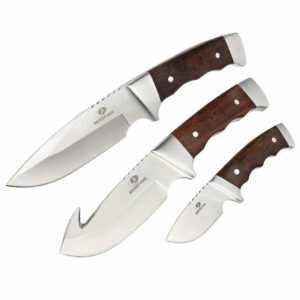 The handles are custom made with beautiful brown wood and give the knife a rustic vibe. The best part of the knife is that it is accompanied by a gut hook which is absolutely helpful to reach the abdomen for the animal without tearing apart the organs. This is ideal to use in your kitchen or on any hunting trip. However, don’t forget to rub some vegetable oil coating on the knife after usage to maintain its quality and sharpness for a longer period of time. 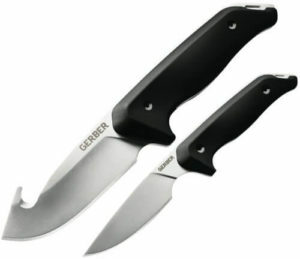 The Gerber Moment Field skinning knife kit is a great one to have added to your hunting gear or knife set. The small skinning knife can be used to de-skin and cut the meats off of the bones as well. It de- skins the meat efficiently without snagging and ripping off the meat with the skin. It comes along with a gut hook which is a fantastic tool for making larger cuts and reaching into the abdomen of the animal. This set is ideal to carry along on a hunting trip as each tool complements the other. You can easily stack them in a sheath while packing for an outdoor trip as well. 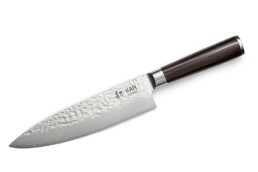 The knife is constructed from a full tang which makes it very strong and durable. The handles are made of textured rubber giving you a better grip and stability. The blades are shiny and polished with a glass bead finish. 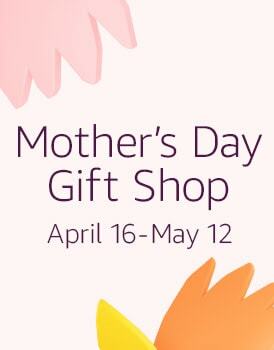 It comes in a sheath of nylon with handles made of metal for carrying conveniently. Add this to your collection and you will effortlessly skin your animals and the preparing process of the meat will become much faster and simpler. Are you looking for a great quality folding knife for skinning and deboning purpose, and then this one is the one for you. The outdoor edge RazorLite EDC folding knife is excellent at slicing off the skin from the meat without causing rips and tears. It is extremely easy to use and can be worked with a single hand. The blades on this knife are easily replaceable and can be changed with a single push on a button. The knife is made up of blades of the most superior quality and is extremely sharp which makes it ideal for skinning meat. The blades are made with stainless steel which is great for knives of any kind as it protects the knife from corrosion, discoloration, and rust. The rubberized grivory handles are super light in weight and provide you with better grip due to the TPR insertions. 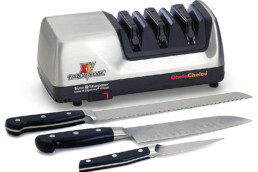 You can easily find it replaceable blades in the market or this appliance and the price is very friendly as well. So delay no more and get yours today. 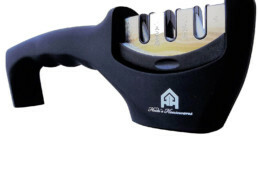 The Meyerco gut hook skinner is a must have in your hunting gear if you are a passionate hunter. It has an outstanding stylish outlook that is hard to look away from. The Mossberg blades are fixed with the handle and come along with a gut hook. So it is an all in one tool for your hunting trip. The blade has been made from stainless steel with non-glare features and is about 3 ½ inches long. What gives it a stylish look is its camouflage handle with a very relaxed grip. Not only does it look spectacular in the blend of black and camouflage, but it is very sharp and proficient at the job it is made for. The set comes in with a cloth sheath of Ballistic which is very convenient to carry it along without hassle. The compact size of the knife is ideal for skinning a mid-sized game and the razor-sharp blades make the work super-fast and easy to perform. 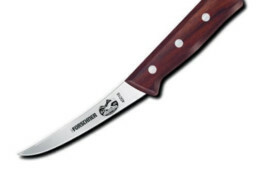 The Oldtimer sharpfinger is a traditional skinning knife with a fixed blade feature which is great for using for outdoor on hunting trips and is even preferred by professional chefs. It comes in several different sizes which makes it very convenient as you can use it as per the size of animal you want to skin. Whenever it comes to knives you can always trust Oldtimer. This knife comes in two different blade sizes one of it is 7.1 inches long and the other one is 3.3 inches. The knife is short and compact and weighs only 3.1 ounces and comes in a leather tie sheath which makes it easier to carry along. The blades, made of high-quality full tang carbon stainless steel, are extremely durable and rust proof. 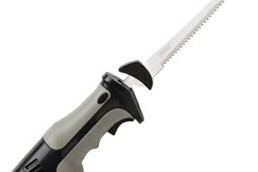 The handles are securely attached to the blade and give you a comfortable grip while skinning and deboning. This knife can skin the animal in a minute with only a few strokes reducing your work to a minimum. Are you looking for a stylish and attractive skinning knife to add to your hunting gear? Then the search is over my friend. Let us showcase the Gerber vital skinning and gut hook knife which is a highly proficient skinning tool applicable to use outdoors and in the kitchen as well. 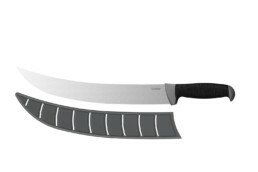 It comes with the most unique shaped blade that allows you to go through the skinning process effortlessly within minutes. The gut hook feature makes it an all in one knife for any hunting trip you are planning. This skinner can skin mid to large sized game with ease. 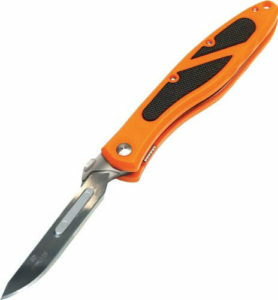 The attractive orange rubberized handle provides you better grip and comfort while doing the job plus gives the knife an attractive outlook. The tool also comes with grooves which are ergonomic. 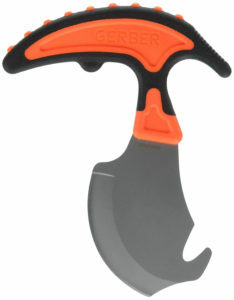 If you are looking out for an affordable but efficient high-performance skinning knife then this Gerber skinning tool is just for you. This is a strong and long lasting knife is you maintain it well and is a great value for the money you pay. 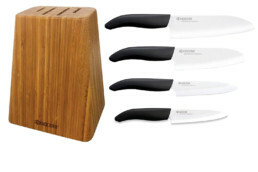 The Mossy Oak skinning knife set has won over the hearts of many professional chefs and passionate hunters with its spectacular razor-sharp blades and stylish looks. The knife is made from a single full tang, high-quality stainless steel blade that makes it resilient, strong and resistant to any abrasion and rust. 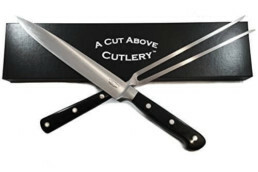 The knife comes in several sizes which makes it convenient to use on any sized game. The set includes a gut hook knife, a large drop point knife with razor sharp blades, a small drop point knife and a sheath to carry the entire set without any hassle. The sheath on its own is made from premium quality material with button closure and a buckle closure as well to keep the knives locked in tight preventing them from slipping. The set accommodates six pieces of grooves which are completely anti-skid and has been fashioned ergonomically. 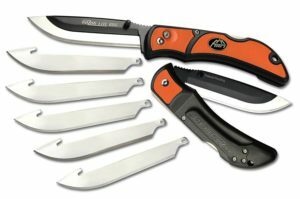 This heavy-duty knife set is applicable to be used in hunting, industrial, military and survival situations as well. The Havalon Piranta Z is a folding skinning knife to accompany you in your hunting trip. It is not just applicable to hunting, but a great tool to keep along for hiking trips as well as it comes in great help in survival situations as well. The blades are of a length 2 ¾ and are perfect to skin mid-sized game. The handle is made out of ABS plastic. Its compact structure makes it ideal to carry on for outdoor activities. If you are looking for an affordable option with great quality blades then this knife is your best pick. When it comes to skinning knives it will be unfair not to mention this globally renowned brand who specializes in making sharp-edged knives, pocket knives and several other such tools. 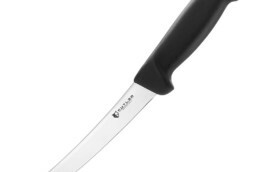 The Victorinox beef skinning blade with fibrox pro handle is a high quality skinning tool used by professionals. The blades are strong, resilient and razor-sharp to slice off the skin and membrane with only a few strokes, which means you need to put the most minimum effort for the job. It is very robust and compact on size and shape which makes it ideal to carry for outdoor hunting activities as well. 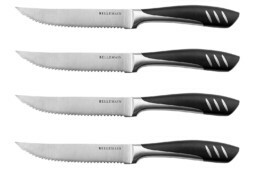 These were the best and top 10 skinning knives leading the market these days. If you are having confusions about which one to pick amongst hundreds then this article will surely help you to make the decision. A skinning tool is a vital component for your hunting gear. These high quality knives are not just efficient and limited to hunting trips but are great to carry along in long hiking trips as well and come in great use in survival situations as well. So whether you are a passionate hunter or a professional chef or own a butcher shop, these knife is great for all and a must have to include in your knife set.